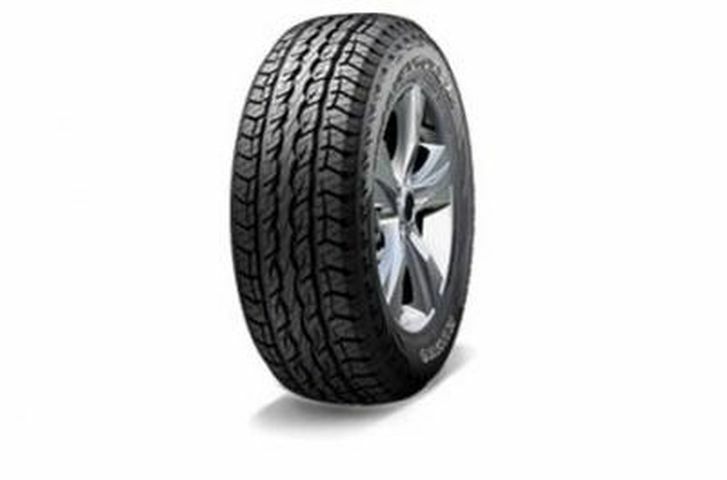 The Kumho Road Venture SAT KL61 is a stylish all-terrain tire for modern SUVs. It features a unique tread compound that provides improved wet grip and minimizes tread wear. In wet conditions, the four channel grooves combine with the serrated side blocks to drain water from the contact patch. This results in better safety and traction. Longitudinal ribs provide straight line stability even at high speeds. P235/75R-15 640AB 2,039 lbs 51 psi 14/32nds 6.0-8.0" 9" N/A 29"
Purchase includes the Kumho Road Venture SAT KL61 tire only. The wheel rim shown in the picture is not included. Picture provided is a stock picture from the manufacturer and may or may not reflect the actual product being ordered. All Kumho Road Venture SAT KL61 tires are continuously developing with manufactured improvements. With that said, Simple Tire and the manufacturers have the right to change these tire specifications at any time without notice or obligation. Please Note: Specifications of the Kumho Road Venture SAT KL61 tires shown above are listed to be as accurate as possible based on the information provided to us by Kumho tires. I bought the first 2 at wal mart they discontinued.Searched all over for mach pair thanks simple tire these are great tires. Seem great so far. Good buy.